The Little Plus: the fireplace located in the corner of the bedroom — beautiful and so cozy! And note how the interior designer matched the color of the linens with that of the walls — nice touch. 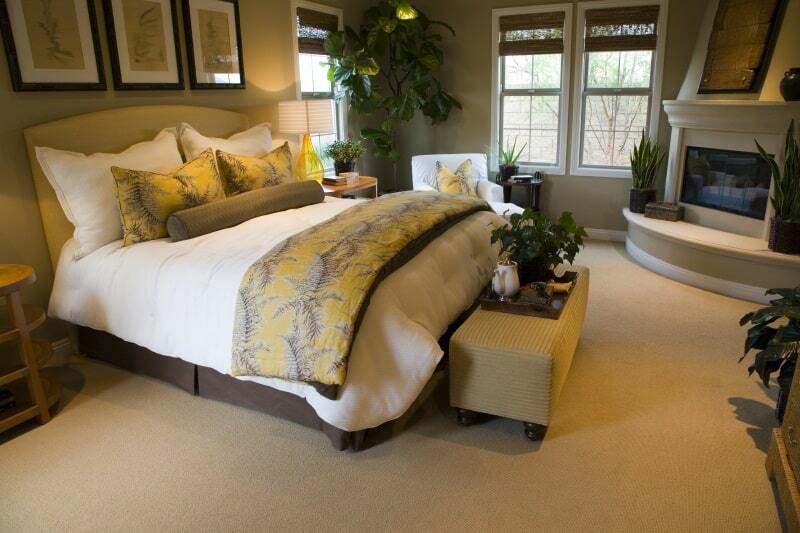 Also, the addition of all the plants adds a nice calming and refreshing feel to this getaway master bedroom. The Little Plus: the tufted upholstered headboard in light gray combined with the handmade curtain design gives a romantic touch to this bedroom. 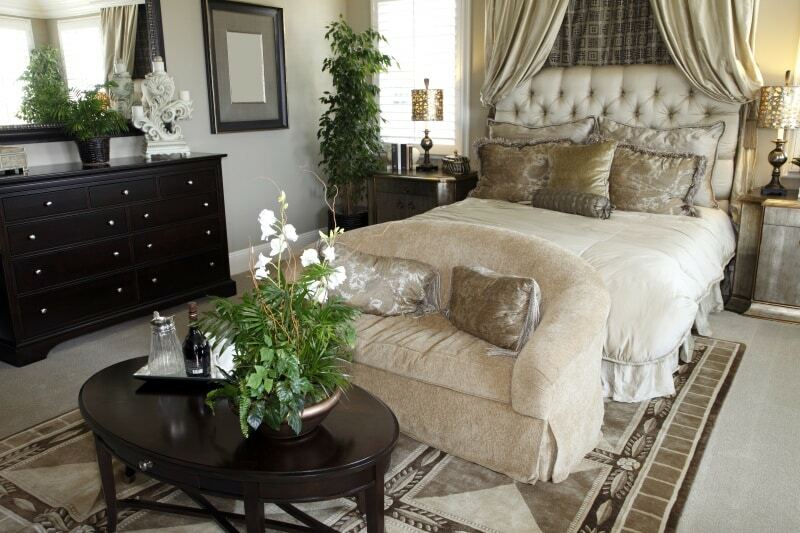 The two nightstands, hand painted in a grayish tone with golden trim, brings a royal seal to this master bedroom. And as is always the case with flowers, the addition of the tall white flowering table plant is welcoming and brightens the room. The Little Plus: the coved crown molding makes the ceiling look higher. Super charming white caned bed frame — so shabby chic! 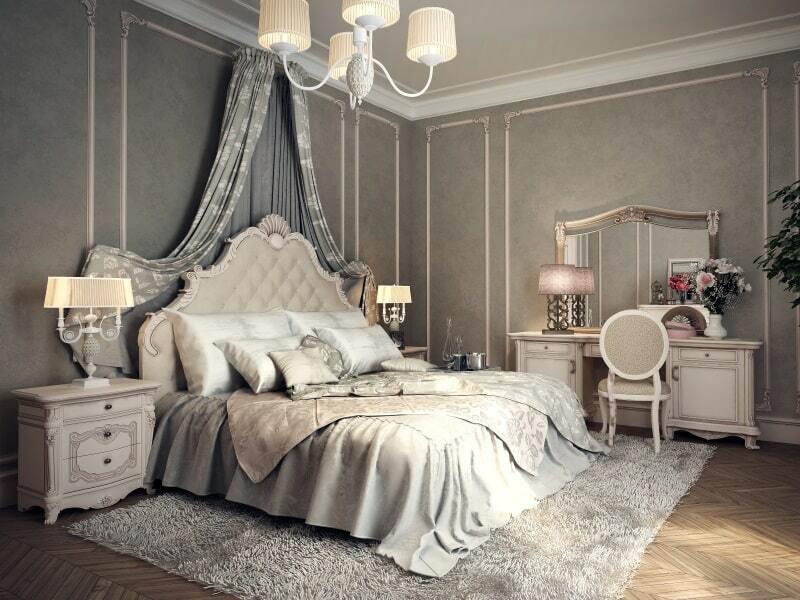 The Little Plus: the beautifully carved baroque headboard reigns in this monochrome master bedroom. The antique white vanity with mirror, that doubles as a desk, is very elegant and the Louis XVI chair adds a gentle touch of luxury. Also, notice the white framing on the grey walls and ceilings — great idea to lighten up the room and add flare at the same time.